The United States successfully tested a sea-based component of its missile defense shield Thursday evening, intercepting a ballistic missile with a dummy warhead over the Pacific Ocean, the U.S. Missile Defense Agency said. The exercise was the 19th successful test in 23 attempts of the system — known as the Aegis Ballistic Missile Defense Program — since 2002. A target missile was fired from Hawaii about 5:40 p.m. (11:40 p.m. ET) and was tracked by Navy ships hundreds of miles away. 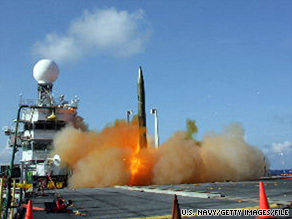 The USS Hopper, one of three Navy ships tracking the launch, fired an interceptor missile, which struck the target about 100 miles above the Earth. The process — from launch to shoot-down — took less than five minutes, according to the U.S. military. The United States plans to use the sea-based system on Navy Aegis-class ships to protect against incoming short- to medium-range missiles fired from hostile countries. Eighty-six of the ships eventually will have the capability. Another part of the missile defense protection — ground-based midcourse defense — is designed to strike at long-range missiles. Both the sea-based and ground-based systems are part of the Pentagon’s “layered” missile defense plan. Much of the missile defense program is still under development, including lasers fired from a plane that the military hopes would destroy an enemy missile during launch. Other parts of the missile defense would fire short-range missiles at incoming warheads that are close to hitting their targets. Over the past seven years, the U.S. military has spent billions of dollars on the missile defense program. Pentagon officials have said that each missile defense test costs about $85 million.